The major alterations and additions to the Buchanan Street offices of the Glasgow Herald newspaper were one of John Honeyman & Keppie's biggest jobs, and one of the outstanding commercial building projects of 1890s Glasgow. The main element (phase 3 in John Honeyman & Keppie's job book) was a large new building at the rear in Mitchell Street. The job books also record a number of smaller, self-contained schemes for fitting out individual offices, and for other alterations. Authorship: Mackintosh himself claimed responsibility for the Mitchell Street building. 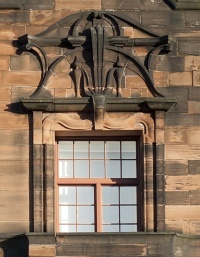 His handwriting is on many of the surviving drawings, at least one contemporary architectural periodical ascribed the 'individuality' of the design to him, and the architect W. S. Moyes, who later worked in Honeyman, Keppie & Mackintosh's office, stated the Glasgow Herald was Mackintosh's design. 1 However, it is extremely unlikely that such an important commission would have been placed entirely in his hands while he was still a young assistant, and there must have been substantial input from John Keppie, and possibly John Honeyman.